Running lxc v2.20 on Ubuntu 16.04 and am looking for the lxc-top command. It seems this command was working with lxc v1.0. I can’t find any packages in the apt archive that matches this name. Anyway, lxc-top still exists in the lxc-utils package. Sadly it can’t be used with lxd. Thanks for the info. I knew about the “apt cache search” function but did not know about the apt-file command. Very cool! FTR, what essential feature do you feel brings sysdig+falco that lxc-top is missing ? I never used lxc-top before. I just needed a tool that would list all running containers and their respective performance (RAM, CPU, etc). after testing a bit, it’s still possible to use lxc-top, even with lxd. You can use systemd-cgtop (no sudo required). 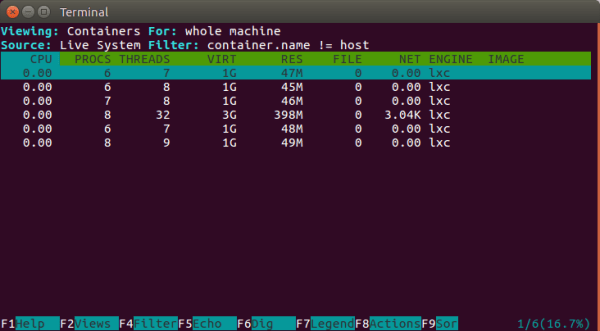 It shows the stats per Control Group (cg), which, in LXC/LXD, correspond to each container.